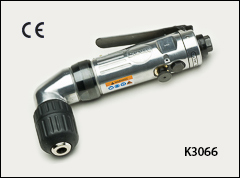 Inline drills, keyed chuck and keyless chuck drills, right angle drill, pistol grip drill. Please see our Drill bits page for high speed steel and masonry drill bits. Grinders are available on the Grinders with collets and Threaded spindle grinders pages. SAFETY WARNING: Make sure the RPM of the drill you choose below, does not exceed (is less than) the maximum RPM of any accessories you use with that tool. WARNING: Proposition 65 Label for all St. Louis Pneumatic drills shown below. 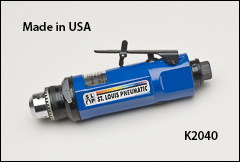 St. Louis Pneumatic 20,000 RPM performance or a low speed version. Both with rear exhaust and safety throttle lever. Please call for lower prices for 10 and 25 tool orders. K2040 is 1.6 lbs. K2050 is 2.25 lbs. 3/8" chuck, 0.50 HP, 4 CFM @ 90 PSI, 1/4" air inlet, 3/8" minimum hose size. Sioux Force small design allows work in confined and hard to reach areas. 8" long. Built-in speed regulator, rear exhaust, aluminum housing, and lockoff lever throttle. 3/8" chuck, 0.50 HP, 10 CFM @ 90 PSI, 1/4" air inlet, 3/8" min hose, 2 lbs. Sioux Force right angle design allows work in confined areas. 8" long. Gears designed and built tough. Built-in speed regulator, rear exhaust, and aluminum housing. 3/8" chuck, 0.50 HP, 10 CFM, 90 PSI, 1/4" air inlet, 3/8" min hose, 2.5 lbs. Sioux Force aluminum housings with insulated grips to reduce cold and vibration. K3067-0.33 HP, 4.2 CFM, 7" long, 2 lbs. K3068-0.33 HP, 4.2 CFM, 8" long, 3 lbs. K3069-0.50 HP, 4.3 CFM, 9" long, 4 lbs. 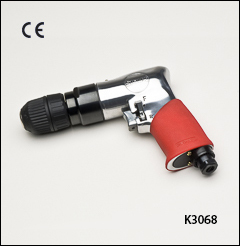 All 3 drills: 90 PSI, 1/4" air inlet, 3/8" hose size. St. Louis Pneumatic lightweight pistol grip design. Through-handle exhaust. Includes a chuck key. 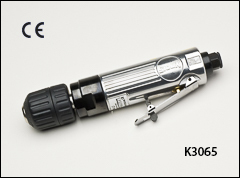 Lower prices available for 10 and 25 tool orders. K2055-5.25" long, 2.25 lbs. K2062-7.2" long, 3.3 lbs. K2067- 8.6" long, 4.2 lbs. 3/8" or 1/2" chuck, 0.50 HP, 6 CFM @ 90 PSI, 1/4" air inlet, 3/8" min hose size.